One hundred years ago today, Julia Child was born. Once a typist working for the U.S. government, Julia became a culinary legend with the publication of Mastering the Art of French Cooking. By introducing Americans to the French ways of cooking, Julia sparked conversations about how Americans eat, and thus propelled many into the kitchen. Meticulously researched and tested, Julia’s recipes are foolproof and palatable. With her unrelenting charm and unflappable demeanor, the French chef taught us lessons that extended beyond kitchen knife skills and chicken deboning. From making mistakes to never being afraid of sticks of butter, this fixture of culinary culture will always be remembered. 1. It’s OK to make mistakes. There is a famous episode of The French Chef in which Julia attempts to flip an omelet only to see it on the floor seconds later. Since there were no retakes in front of the camera, she acted as if nothing had happened. Instead of fumbling in front of the camera, she continued on, picking up the egg mixture from the floor and returning the pan to the stove. Her sincerity and ability to laugh at herself made Julia such a heartwarming and relatable character. She showed us that it is OK to make mistakes because you can learn from them. Cooking is an ongoing experiment and so there will inevitably be failure. Through her persistence efforts writing Mastering the Art of French Cooking and when cooking onscreen for her television show, Julia reminded us that in order to succeed, you have to keep trying because ultimately you will be satisfied. 2. How to speak French (somewhat). Julia’s signature catchphrase at the end of her show was “Bon Appetit.” Although today the meaning behind the words is common knowledge, Julia introduced to many of us a foreign vocabulary. Since she had never spoken French before living in Paris, there was no hiding Julia’s American roots in her language skills, but she gradually learned by studying a common language among us all: food. From consommé to crepes, flambé to fricassé and pâte to poussin, Julia taught us not only the French words for certain ingredients, but also the French techniques for preparing them. 3. The definition of an aspic. Epitomized in the film Julie and Julia, blogger Julie Powell attempts to make an aspic while completing her mission to cook every recipe in Julia Child’s magnum opus, introducing to audiences a not-so-familiar French dish. In the movie, Julie ruins the aspic after it fails to set properly. Aspics are challenging, to say the least, because they require combining ingredients into a gelatin made of meat stock or consommé. When holding meats, aspics essentially serve as a way to preserve the proteins from spoilage. 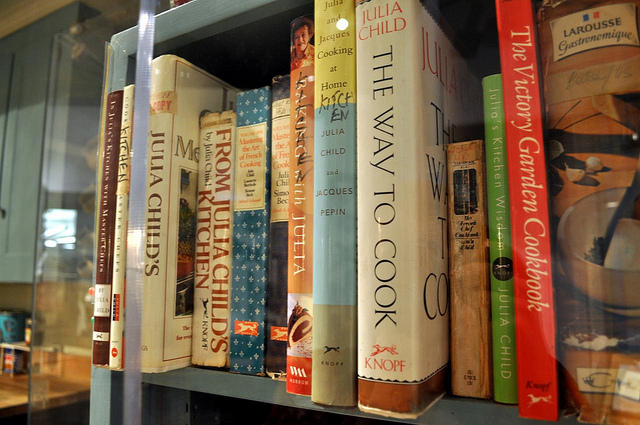 Although Julia included aspics in her cookbooks, their inclusion probably did more to educate recipe searchers than to convince them to whip up an aspic for dinner. 4. French food is not pretentious. A common stereotype characterizes the French as snooty and uptight. Although the merits of this stereotype might warrant some debate, one thing is certain: French food is not snobbish or overly complicated. In fact, Julia taught us that French food is accessible even by the average American cook. Amidst more complicated and time-taking recipes like beef bourguignon and raspberry bavarian cream, Julia included simple, memorable dishes, such as perfectly poached eggs and peas with butter. Julia knew that for Americans time mattered, and so she made sure to adapt French recipes to the convenience and busy lifestyles of Americans. 5. There is no substitute for butter. Julia once jokingly remarked, “If you’re afraid of butter, use cream.” While wielding her sense of humor, Julia emphasized a key point to French cooking: there is no substitute for fat. If a recipe calls for butter, replacing it with applesauce, yogurt or even margarine is not an option. French chefs are not worried about the number of calories or fat grams in their food; they are more concerned with how it tastes and how the flavors of ingredients combine. But that doesn’t mean that the French don’t recognize too much of a good thing. As the French paradox demonstrates, it is possible to enjoy foods rich with butter and cream and still maintain a healthy lifestyle. 6. Cooking in pearls is perfectly acceptable. When writing her book, Julia Child made a point of marketing her recipes towards Americans housewives. Yet while she tried to attract more women into the kitchen, a place stereotyped as the center of women’s domestic domain, she empowered women to try new things and not be afraid of failure. After being rejected from a publisher early in the development of her famous cookbook, Julia did not back down and continued to work. She did it with energy, passion and fortitude as she tested recipes in her pearls and apron. She showed women that cooking did not have to be another household chore, but rather an opportunity to challenge themselves and take control of their creativity. 7. Anyone can learn how to cook. Julia was 32 years old when she moved to Paris, the age she says she first learned to cook. After arriving in the city with her husband Paul, Julia enrolled in the Le Cordon Bleu Cooking School. Even with her amateur status and limited French skills, Julia quickly learned the tools of the trade and successfully completed the cooking course alongside more experienced cooks. Her lessons left her captivated and hungry to learn more about how to create the right proper emulsion for mayonnaise, among other things. She spent hours outside of class cooking, sampling, shopping, doing all she could to become a better student and thus a better chef. Through her cookbooks and her television shows, Julia aimed to educate her audience and make them unafraid of the the kitchen. She wanted to show how even the most inexperienced cooks could create a meal without complication or fancy ingredients.